This project took me two long, hard days to finish. But I am proud of it. 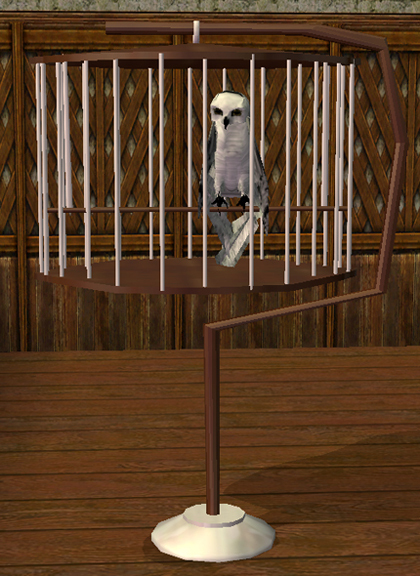 This is my first Sims 2 object, an owl pet. It is a tribute to Harry Potter. I made this pet by using and slightly altering Rebecah's animated owl mesh and MissWendy's bird cage mesh. I am so grateful to both of you for making such wonderful meshes to work with. Thank you both so much! The owl is Rebecah's animated owl mesh with no 'horns', and with wings that flap and fly. The owl animates well, except there is a small gap in the right wing when it takes off for flight. The cage is MissWendy's bird cage mesh without the bird and greatly resized. It has no door or feeder. I looked at pictures of Hedwig's cage and did not see a feeder so I left it this way. Don't worry though, your owl can still eat! As for the door, I may add it later. Also, there is no 'dirty' cage recolor, so make sure you check your owl's cage often to see if it is dirty. I may add this later as well. 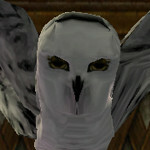 So far there is only one recolor, and it is based on a Snowy Owl, or Hedwig from Harry Potter. If anyone has suggestions for recolors, you may post them, but no promises as I am not the best at texturing. I basically recolored Rebecah's owl's texture to make this recolor. Oh, and yes, the sim pictured is Snape! Fire Fox - Red Panda With a Cat Base!